This is the story of a garden that got way out of control. It started off simply enough. An order of seeds, some wood, a new rake, and a pickup truck filled with fresh compost. I came to learn of the importance of food heritage through Slow Food's Ark of Taste, aimed at preserving the stuff that might have been on grandma's table, but sure doesn't make it into today's produce aisle. A tomato isn't just a tomato -- it's a beefsteak, or it's a Brandywine, a German Pink or a Djeena Lee Golden. What you grow reflects who you are. In efforts of tapping into some uniquely American food traditions, I started off with heirloom seeds I'd never heard of, and got digging. After a few attempts at indoor seed-starting, we planted. Everything from fish peppers to Cushaw squash, Cherokee purple tomatoes to tennis ball lettuce went into the garden. I didn't expect everything to make it: Perhaps too much went in, because our once-neat rows of three-inch-tall seedlings quickly became a tangle. Pretty soon we had a glut of radishes and lettuce. Not long after that, as the days grew longer and time in the garden became sweatier, some fearsome little specimens popped up alongside the slowly ripening tomatoes. Our hot pepper crop was prolific. 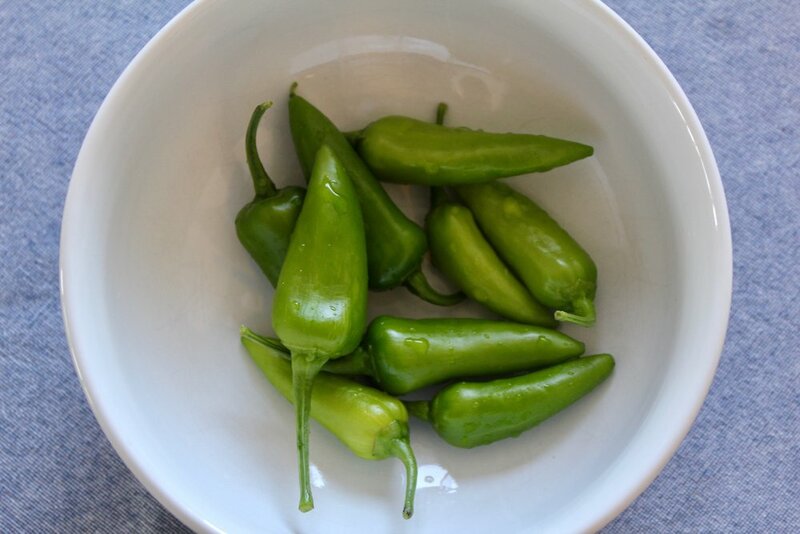 Besides the subtly striped green fish peppers, we also grew about three million habaneros and enough ghost peppers to strike fear into the heart of the neighborhood. So, hot sauce was the natural next step. Adapted from a recipe for Pineapple Habanero Hot Sauce. Add olive oil to a large stock pot and heat over medium. Sauté shallots, garlic, and onion in olive oil until lightly browned. Slice tomatoes and add to pot. Meanwhile, shred the carrots in a food processor. Peel and slice peaches, adding to pot. Allow to cook for 5 minutes. Add apple cider vinegar and coconut palm or brown sugar to pot. Continue to cook on medium heat for 20 minutes. Cool the mixture in the refrigerator. Add to food processor and blend. The mixture will likely be quite thick, to start. Add white vinegar as needed, and process until it reaches desired consistency. Slowly add water, if the consistency is still too thick. Fish peppers were originally used (as one might have expected) in seafood dishes in the mid-Atlantic. An African-American heirloom ingredient traditionally paired with shellfish, the fish pepper got its start by the Chesapeake Bay. This sauce is a ode to trying the old-school stuff in your garden. Every ingredient has a history; at one point in time, someone's hand cultivated each and every thing we eat. This summer, I discovered the surprisingly flavorful tennis-ball lettuce (traditionally pickled), and the peppery punch of a nasturtium flower (an edible blossom -- not just for show). So get a seed-starting tray, start early, and order some weird seeds on the internet. Thank your ancestors for what you find.